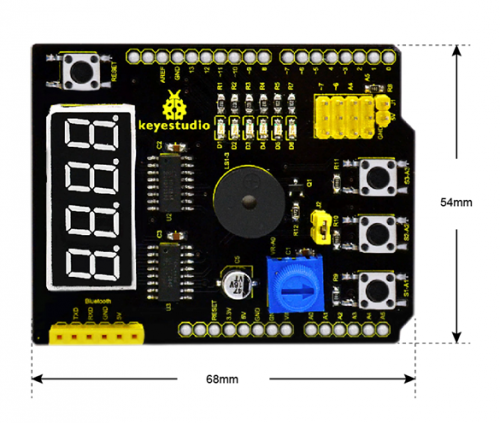 Multi-purpose Shield V1 is a learning board based on Arduino. No need for soldering and connection.Download the program to complete experiment. It is multi-purpose and we offer code libraries of all modules that have been tested. You can use them directly. There are extension ports on the shield to help you to complete other experiments. Compatible with main controllers such as UNO R3 and MEGA2560. 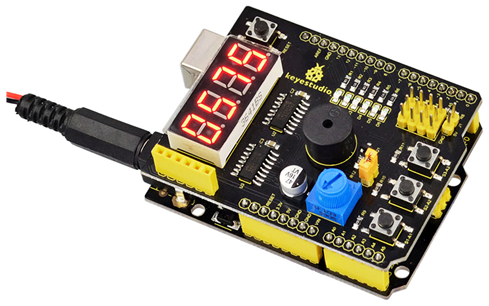 Comes with 6 LED indicators to show the program status. Comes with a passive buzzer for alarm. 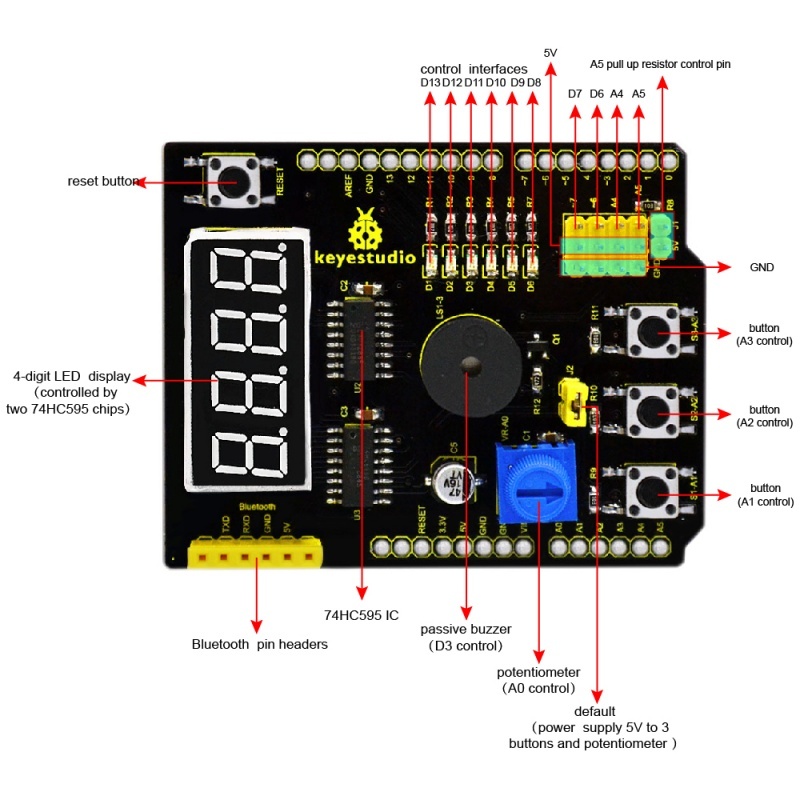 Simply plug the shield into UNO R3 board or MEGA 2560. 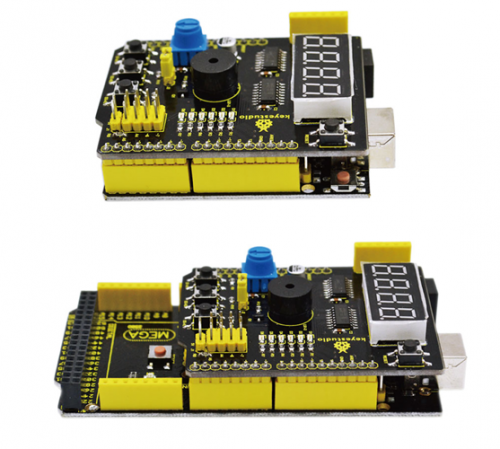 You can click here to download the code or directly copy the code below to Arduino software. 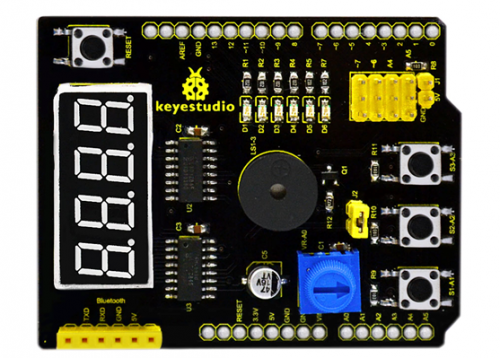 Done uploading the code to the board, power on the board, you should see the 4-digit LED display the number. Shown below. The analog value output by potentiometer is showed on the 4-digit LED display. Press the button S3-A3, the 6 SMD LEDs will light up one by one like the flowing light, but 4-digit LED display is off. Press the button S2-A2, the passive buzzer will beep and 4-digit LED display is still off. Press the button S1-A1, 4-digit LED display will show the default number 0123.